Facet joint arthritis is a very common cause of low back and neck pain in adults. It is a condition in which the small joints, called facets, in the back of the spine become arthritic and painful, similar to the way arthritis in the knee or hip is painful. Facet joint arthritis is also known as facet arthropathy or spondylosis. Facet joints connect the vertebral bodies, or bones, in the spine to one another and help keep the spine stable with normal movement. Facet joints are lined with cartilage, contain a small amount of joint fluid, and are encased in a joint capsule. There is a pair of facet joints at each level, and they are named for the vertebral bodies they connect. For example, the L4/5 facet joints connect the lumbar 4 and lumbar 5 vertebral bodies. How does Facet Joint Arthritis develop? Each facet joint is lined with cartilage, and over time the cartilage may thin and wear out. As a result, the joint will become inflamed and develop bone spurs, enlarging the joint. This is also called facet joint hypertrophy. 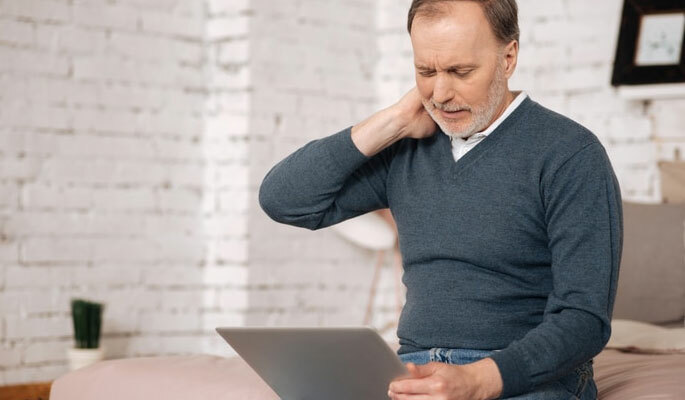 These changes can be due to a variety of factors, but typically anything that puts greater strain on the facet joint over time, such as manual labor, obesity, lack of exercise and deconditioning, will lead to degenerative changes in the joint. Genetic factors may also play a role even in the absence of these factors. Where does Facet Joint Arthritis occur? Facet joint arthritis commonly occurs in the low back or lumbar spine. It also occurs in the neck, or cervical spine, and to a lesser extent in the upper back, or thoracic spine. The lower lumbar facet joints, such as L3/4, L4/5, and L5/S1, are the most common location of facet arthritis because they carry the greatest weight compared to other areas of the spine. In the lumbar spine, the symptoms are typically lower back pain, which may be accompanied by radiation of the pain to the buttocks or the back of the thighs. In the cervical spine, the symptoms are typically neck pain, which may be accompanied by radiation to the shoulders, upper back or to the back of the head. Leaning back and rotating the spine typically worsens the pain. Decreased spinal flexibility and muscle spasm frequently accompany the pain. How do you diagnose Facet Joint Arthritis? A proper history and physical exam may suggest facet arthritis. X-ray, CT scan or MRI may confirm the presence of arthritis; however, facet joint arthritis is just one potential cause of low back or neck pain. If interventional treatments are planned, diagnostic injections with local anesthetic are required to confirm that the source of the pain is the facets. What are the initial treatment options for Facet Joint Arthritis pain? Anti-inflammatory pain medications, muscle relaxers or other pain medications, activity modification, weight loss, physical therapy, and regular exercise all may be helpful at reducing pain. What are the options if conservative treatments fail? Because back and neck pain may have multiple causes, first one must confirm that the facet joints are the source of pain. To determine if the facet joints are causing pain, a diagnostic injection of local anesthetic can be performed, either into the facet joint, or around the nerves that sense pain in the facet joint. These nerves are called the medial branch nerves. If pain is reduced by this diagnostic injection, then a procedure called a rhizotomy is performed. A rhizotomy uses radiofrequency energy to heat the facet joint nerves so that they can no longer sense pain. In cases where an enlarged arthritic facet joint is causing nerve compression or spinal stenosis, referral to a spine surgeon may be indicated. How do you keep Facet Joint Arthritis pain from returning? Intermittent flare-ups are common with chronic back and neck pain. The best long-term pain management strategy consists of regularly participating in exercises that restore spine health and stability. With the assistance of a Physical Therapist, participating in a home exercise program that focuses on increasing strength, endurance and flexibility will be the best defense against chronic pain.